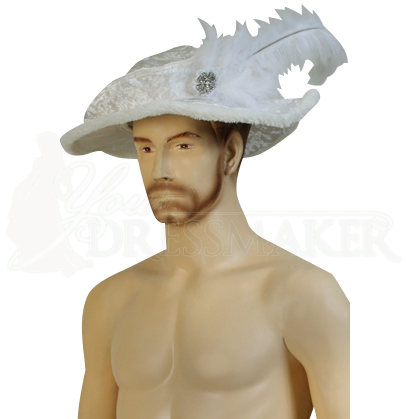 Incredibly regal with a soft feel and majestic luster, the Mens Crushed Velvet Tudor Hat is an outstanding take on historic fashion. Fit for noble, sophisticated looks, this hat features faux fur trim and a decorative ostrich feather on one side. Available in various neutral colors sure to match the ensemble of any historic nobleman or royal figure, this hat is ideal for your most elegant Renaissance, Baroque, and medieval looks. Handmade with skill, this hat is made from crushed velvet, giving this piece a regal sheen. Wear it to your next historic reenactment occasion, Renaissance faire, or for any elegant costumed event that requires an outstanding period look.